If you've never thought about having a rope operated ladder, now is the right time to consider it. Our three section rope operated heavy duty ladders allow you to erect your ladder with minimal effort, greatly decreasing the risk of you straining yourself when setting up for a day of work. Made of aluminium and finished with heavy duty box section stiles with radius corners, these ladders have increased strength and durability. They are available in a choice of extended heights; 7.3, 8.8, 10.3 and 13.3m - the serrated rungs that are fitted through the stiles are set at a standard rise of 250mm, giving the user comfort and security with solid foot grip when climbing or descending the ladders. There are three sections, allowing them to be easily transported to and from locations; the serrated rubber feet give the ladders extra stability when placed against a wall or on other surfaces. 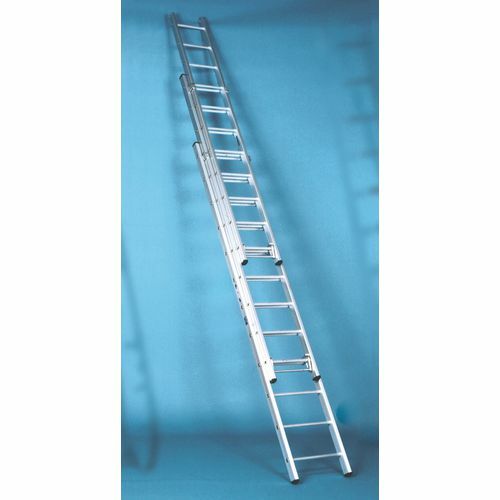 We think our rope operated heavy duty ladders are great tools that will help you feel safe and supported when working at high above ground levels, they are manufactured to British Standard 2037-1994 Class 1 for heavy duty industrial use and benefit from FREE Delivery and 12 months guarantee.